The pivot point of a layer determines where is the axis around which a layer is rotated or on which the layer is scaled when you rotate or scale the layer with the Layer Transform tool. By default, the pivot point of a layer is at the centre of the stage. You can reposition that pivot point to adjust the way your layer rotates or scales when animated. IMPORTANT Changing the pivot point of a layer affects the position of its pivot point throughout the entire panel. 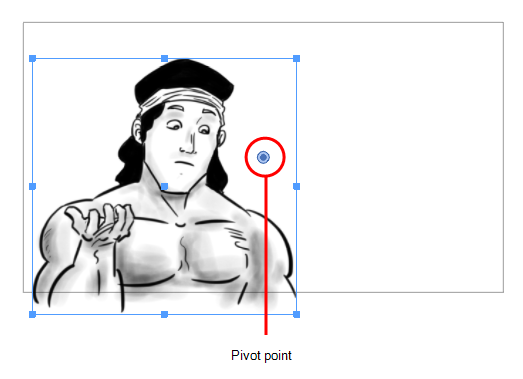 If your layer is already animated and you change the position of its pivot point, its position at the current frame will remain the same, but Storyboard Pro will have to adjust the position of the layer in other keyframes to work with the new position of the layer's pivot, which might negatively impact your animation. 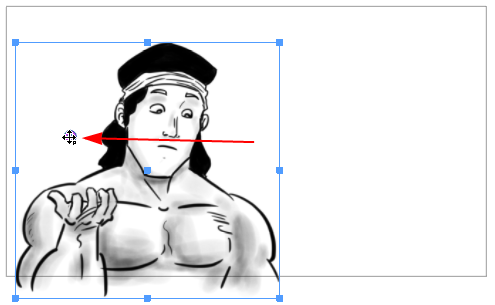 Hence, it is recommended to set the pivot point of your layer before animating it. From the Tools toolbar, click the Layer Transform tool. Select Tools > Layer Transform. The selected layer’s transformation controls and pivot point become visible. The pivot point is represented by a blue circle at the centre of the camera frame. In the Stage view, drag the pivot point to new location. The new location of the pivot point will now be used as the reference when transforming layers. In the Stage view, select the layer with the pivot you want to set at the centre. In the First Frame Transform Tool Properties view, click the Center Pivot on Selection button. Select Layer > Pivot > Center Pivot on Selection. The pivot position is reset to the centre of the selection. In the Stage view, select the layer with the pivot to reset. In the First Frame Transform Tool Properties view, click the Reset Pivot button. Select Layer > Pivot > Reset Pivot. The pivot position is reset to the centre of the camera frame.